Imagine you are in a play, and they hand you your lines. You have to read them, and memorize them, and practice saying them. Perhaps you are unfamiliar with some of the words, you would have to learn the pronunciation, and practice saying the word correctly (Microscopic Practice). Perhaps you had a problem remembering all the lines, and saying them at the right time. You would have to work that out as well (Assimilating). Finally, it would be rehearsal time. You would be expected to have your lines down, and as the opening night came nearer, the director would expect you to be pumping blood into that part, and delivering a real flesh and blood character to the audience. He or she would be trying to help you and guide you to an ultimate vision of that character’s essence. The greater the actor and director, the more powerful that final vision and product will be. That final process is Shaping. This is what we need to do with our music, to the best of our artistic skills, at any point in our development. Interestingly enough, many guitar students avoid this aspect of practice. They actually avoid putting everything together, and doing what guitar players are meant to do: “play” the guitar. This avoidance also prevents them from developing themselves into something that every guitar player should be, something that is actually more important than becoming a guitarist – becoming a musician. 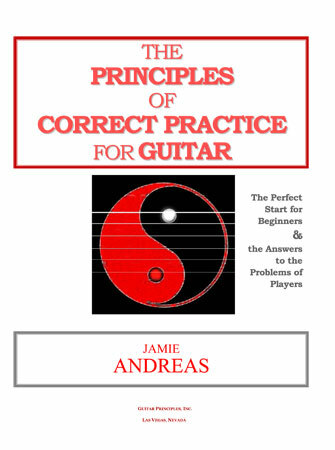 “The Principles of Correct Practice for Guitar” teaches you how to do the 3 levels of practice necessary for mastery of your music on a physical, emotional and musical level. Why do guitar students avoid this? Many guitar students are afraid of putting everything together! They are always “trying” to learn a song, solo, or piece of music. They do not know how to do the first two levels of practice, and because of this they make many mistakes during playing, and breakdown all over the place. If they were to try to put all the music together and play it from beginning to end, they would get so frustrated and depressed at their inability to get through the music that they would feel like they might as well stop fooling themselves, do the world a favor, and give up the guitar! Every guitar student must learn the first two levels of practice before they are even capable of the third level. We must be able to actually teach our fingers to do what they have to do to make each note we need, and we need to be able to string all those movements together into one continuous flow, so that our music can be given birth. But like everything other living entity, after being born, our music must be developed. It must “grow”, it must “mature”, and ultimately, have a life of its own that nonetheless reflects where it came from. All those who are already musicians know this, and do this. And so must every guitar student if they wish to become guitar players and musicians. How do we develop the music we play after we have given it birth, or the possibility of existing? How do we turn the results of the mechanical process of learning new finger movements into the wonderful emotional phenomenon we call “music”? Like so many other things in life, there is only one way to do it, and that is to do it! We must sit down, or stand up with our guitar, and play the music as if we were on stage performing it, or as if we were recording it. We must play the whole thing through, and on top of that, enjoy the music we are making as we do it. We must develop a relationship to the music itself, as if it were a living being we are getting to know. We must let it soak into us and speak to us. We must discover its meaning, for us, and we must let the music tell us how it wishes to be played. I call this process “going for the music”. You may be thinking, “Well, isn’t that obvious? Do you really have to tell guitar players that they need to play the guitar? You don’t have to tell tennis players they need to play tennis do you?” If you are thinking that, and you are a guitar teacher, I guarantee you have many students who are NOT doing this. To them, it is not obvious, they need to be told to do it, in fact, they often need to be forced to do it. I require all may students to do this, perhaps not with everything we work on, but I want to see a “body of work” developing over time, a group of pieces that they can play well, from beginning to end, in other words, a Repertoire. To help them do this, to learn the hard work of “refining” a piece to performance level, I have made the “Guitar Principles Guitar Improvement Workshop” open to everyone, my personal students as well as all interested parties. FREE! Download “The Power of 10”, a special collection of Ten Super Powerful Guitar Articles that will transform you as a guitar player. 1) Pick 3 songs or pieces that you love, and feel are reasonable for you to expect to handle in a technical way. 2) Start with the first one, and begin to practice it with the intention of playing the whole thing from beginning to end. 3) Divide your song or piece into sections. Learn the first section. For a song, you might learn just the intro first, then add the first verse, then the pre-chorus, then chorus. Divide it into sections that make sense to you. 4) Focus on that first section. Do the necessary technical work at the Level 1 & 2 practice. If you use “The Principles”, you will know exactly how to do this. Use “The Basic Practice Approach” to bring the music to a slow but steady tempo. Usually, half of the performance speed is a good first goal. 5) Video yourself playing it. It will probably have various problems and breakdowns. DO NOT GET UPSET! Instead, make the decision to find out what is wrong, by educating yourself about how to practice. Go to my “Guitar Improvement Workshop”. Post the link to your video. You will then be told the nature of your problems and also exactly what you need to do to solve those problems and improve your playing. You CAN be a good guitar player, and reach your guitar playing goals. But you have to do what all the rest of us who have become guitar players had to do. You have to “make it real” by going for the music, and when you find that you can’t quite get what you are going for, you have to learn how to remove whatever obstacle stands between you and your vision of the music. For the ever-evolving guitarist/musician, technical understanding, technical work, and the achievement of greater musical intensity in our playing go hand in hand in each day’s practice. Copyright 2011 Jamie Andreas. All rights reserved. Used by permission. 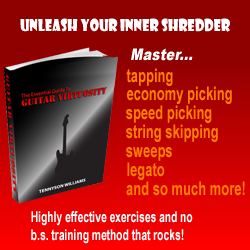 Get solid results from your guitar practice….learn how to practice correctly!